It’s been nine weeks into The Chase and Housemates always feel the pressure of maintaining their strategies and ultimately being the winner. All this requires that the Housemates endure all challenges in the game and therefore remain in Biggie’s House. Kenyan beauty Annabel is very worried that her game will end this Sunday. There are currently three Housemates up for Eviction this week which means the chances of her leaving The Chase are quite high. Annabel has been Nominated every week for the past few weeks and it has finally dawned to her that this time she might not survive Evictions. Her main concern is the fact that she has been Nominated with two of the strongest contenders in the game, Sulu and Elikem. Earlier this afternoon she sat with Eveva, telling her how worried she is that she might be going home on Sunday. She was more stressed about the odds quickly stacking up against her because she’s the most likely candidate to be Evicted because she’s up against only two other Housemates whereas there were six others to choose from in past weeks. Eveva told her to keep the faith and play her game because she is still here. “Nobody knows how Africa will vote,” she said trying to console Annabel. It goes to show that nobody in Biggie’s House can be sure of anything, even strong characters like Annabel get worried about Evictions from time to time especially because there are no more weaklings to Evict from The Chase anymore. Once upon a time, nine weeks ago, Annabel would’ve laughed at the Annabel that we all saw this afternoon. But it’s like Eveva said, your game is not over just yet Annabel, keep your head up because Africa is watching. 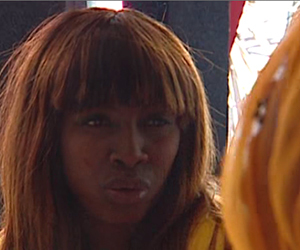 Do you think Annabel will survive Evictions this week? No I don't think she will survive, its her time to leave the house now. As said Sulu and Elikem are the strongest in the house so she must just watch out. She is up against strongest and favourites contenders. I dought. No change for Annabel to go beyond sunday. Sulu will survive, Elikem will pack, if two are going. Annabel must go come sunday. Who says elikem is a strong contender. What was his score the last time he was up. Just Ghana. This time, I think he will get only Ghana nd Zim cos of Pokello, nd probably Nigeria. But that won't be enough for him. Siera-lone won't vote him cos Ghana failled Bassey. I still dnt understand y Ghana did dat to Bassey. Survival is between Annabel nd Sulu cos south nd East africans always stick to their candidates when voting. Melvin for the mula. Annabel be calm u are not going yet.